Mountain View kicked off Lackawanna League Girls’ Volleyball action with a come from behind 3-2 win over Forest City behind the work of setter Tasha Shay. After dropping the first two games 25-12 and 25-23, the Lady Eagles roared back with 25-19 and 25-20 wins in games three and four to set up a decisive game five. Mountain View prevailed, 15-11, in the back forth game before the pulling away to stun the Lady Foresters. Shay dished out 28 assists to lead Mountain View, while Maddie Williams and Rachel Gerfin benefited from Shay’s passes and finished off possessions with eight kills each. Mountain View Coach Dave Breese felt the match changed when Shay became more aggressive and asserted herself. Kara Kelly had 10 assists and five aces to lead the Lady Foresters and Faith Ursich contributed 25 digs. Mountain View carried that momentum into Wednesday’s match with Elk Lake where the Lady Eagles swept the Lady Warriors behind Gerfin and Rumola’s four kills and Shay’s seven assists. Maddie Tewksbury had three kills to lead Elk Lake, with seven aces between Kelsey Day and Allana Warner. The Lady Eagles capped their week with a 3-1 win over Lackawanna Trail to pull themselves over .500 at 6-5 on the year. Mountain View won the first two and fourth sets to win the match. Gerfin and Rumola ruled the nets with six kills each. Shay provided 10 assists. Makenzie Cook had 18 points including 11 aces as Blue Ridge swept Montrose 3-0. Katie White added 13 points and Hunter Heeman led the way at the net with 11 kills and added seven service points. Grace Aukema had seven points and Jessie Fassler had 12 assists to pace Montrose; and Kayden Rowe had six digs and five points. Two nights later Blue Ridge swept Abington 3-0 behind Alison Marshman’s 10 points and nine assists. Jerni Schell contributed 14 digs and Alysa Sherwood added four kills for Blue Ridge. Blue Ridge took a third win on the week with Heeman contributing 12 kills as the Lady Raiders dispatched Forest City 3-1. Cook had 19 points and seven assists and Karly Gudykunst added 16 points for Blue Ridge. Marshman set up the hitters with a whopping 26 assists. 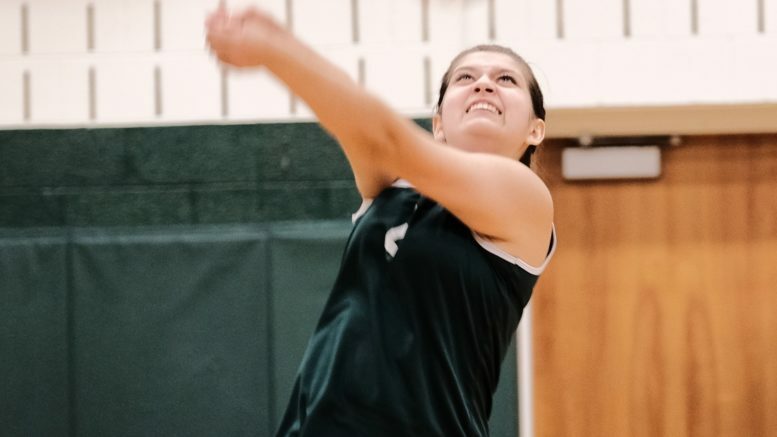 Montrose pulled off a mild upset Wednesday when the upstart Lady Meteors dropped the first game to visiting Susquehanna 25-18 but then came back to stun the Lady Sabers with three straight wins. Aukema led the way with 10 digs and five kills and Fassler had another solid game with 23 assists and 9 service points. Renee Arnold added three aces for the winners and Rowe had eight digs. Susquehanna was paced by Bethany Maby’s 18 points, including five aces, and 13 assists. Kaylee Landry added 15 points (eight aces) and five digs. The Lady Sabers rebounded from the loss to defeat Abington as McKenzie Rhone had 14 kills, many coming off of Maby’s 23 assists. Chloe Tinklepaugh had 14 service points and Bethany Burns had 13. Forest City pulled off a sweep of Lackawanna Trail behind Kiana Savage’s 10 points. Ursich had another solid floor game with 20 digs and Laura Statkun and Summer Wade combined for eight kills. Be the first to comment on "Lady Eagles come back to beat FC"